Jerry Fincher Hough (born 1935) is the James B. Duke Professor of Political Science at Duke University. Hough has taught at Duke since 1973; he previously taught at the University of Toronto and at the University of Illinois at Urbana-Champaign, and he has served as a senior fellow at The Brookings Institution. Hough received his A.B., A.M. and PhD from Harvard University. He plans to stop teaching in 2016 and retire in 2018. He is the ex-husband of the Australian-American historian of the Soviet Union Sheila Fitzpatrick. Hough's research has focused on domestic American politics, the Soviet Union, the democratization of Russia and American efforts at nation-building. Hough is a part of the "revisionist" school on Soviet history, maintaining that the level of terror was much exaggerated and that the Soviet Union was institutionally weak under Stalin, among other things. In 2015, he was the focus of a controversy around his online comment to The New York Times article "How Racism Doomed Baltimore", in which he compared Asians and Blacks and criticized the latter's "lack of desire for integration" and "instead of working hard, only feeling sorry for themselves". He later publicized a letter to further explain his opinions, in which he claimed himself to be a true follower of Martin Luther King Jr. He has been on an academic leave in 2015 that is not related to the controversy. ^ Bibliographic Guide to Soviet and East European Studies, Vol. 3 (G. K. Hall., 1991: ISBN 0-8161-7148-3), p. 328. ^ a b c Drew, Jonathan (18 May 2015). "Duke professor defends comments comparing blacks, Asians". Associated Press. Archived from the original on 20 May 2015. Retrieved 19 May 2015. ^ Craven, Julia (19 May 2015). "Duke University Professor Stands By Racist Comments". huffingtonpost. Retrieved 19 May 2015. The Soviet Prefects: The Local Party Organs in Industrial Decision-Making, Cambridge, Harvard University Press, 1969. The Soviet Union and Social Science Theory, Cambridge, Harvard University Press, 1977.
with Merle Fainsod, How the Soviet Union is Governed, Harvard University Press, 1979. Soviet Leadership in Transition, The Brookings Institution, 1980. The Polish Crisis, The Brookings Institution, 1982. The Struggle for Third World: Soviet Debates and American Options, The Brookings Institution, 1986. Russia and the West: Gorbachev and the Politics of Reform, Simon and Schuster, 1988. Opening Up the Soviet Economy, The Brookings Institution, 1989. Russia and the West: Gorbachev and the Politics of Reform, second edition, New York, Simon & Schuster, 1990.
with Evelyn Davidheiser and Susan Goodrich Lehmann, The 1996 Russian Presidential Election, Washington, The Brookings Institution, 1996. Democratization and Revolution in the USSR, 1985-1991, Washington, The Brookings Institution, 1997.
with Timothy Colton (eds), Growing Pains : The 1993 Russian duma Election, Washington, The Brookings Institution, 1998. The Logic of Economic Reform in Russia, 1991-1998, Washington, The Brookings Institution, 2001. Changing Party Coalitions: The Strange Red-Blue State Alignment, New York, Agathon, 2006. Firestone, Thomas. "Four Sovietologists: A Primer." National Interest No. 14 (Winter 1988/9), pp. 102-107 on the ideas of Zbigniew Brzezinski, Stephen F. Cohen, Jerry F. Hough, and Richard Pipes. Perestroika was a political movement for reformation within the Communist Party of the Soviet Union during the 1980s and 1990s and is widely associated with Soviet leader Mikhail Gorbachev and his glasnost policy reform. The literal meaning of perestroika is "restructuring", referring to the restructuring of the Soviet political and economic system. Valentin Sergeyevich Pavlov was a Soviet official who became a Russian banker following the dissolution of the Soviet Union. Born in the city of Moscow, then part of the Russian Soviet Federative Socialist Republic, Pavlov began his political career in the Ministry of Finance in 1959. Later, during the Brezhnev Era, he became head of the Financial Department of the State Planning Committee. Pavlov was appointed to the post of Chairman of the State Committee on Prices during the Gorbachev Era, and later became Minister of Finance in Nikolai Ryzhkov's second government. 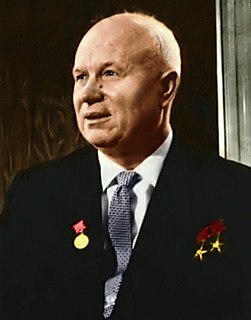 He went on to succeed Ryzhkov as head of government in the newly established post of Prime Minister of the Soviet Union. Geoffrey Alan Hosking is a British historian of Russia and the Soviet Union and formerly Leverhulme Research Professor of Russian History at the School of Slavonic and East European Studies (SSEES) at University College, London. He also co-founded Nightline. The Communist Party of the Russian Soviet Federative Socialist Republic was a republican level branch of the Communist Party of the Soviet Union in the Russian Soviet Federative Socialist Republic. The Communist Party of the RSFSR was founded in 1990. At this point, the Communist Party of the RSFSR organized around 58% of the total Communist Party of the Soviet Union membership. 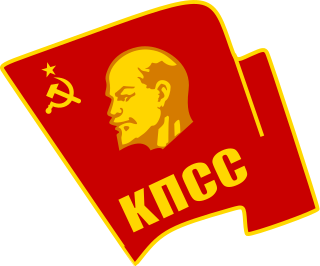 The party was popularly known as the 'Russian Communist Party'. Politically, it became a centre for opponents of Gorbachev's rule. The Chicken Kiev speech is the nickname for a speech given by the United States president George H. W. Bush in Kiev, Ukraine, on August 1, 1991, 3 weeks before the Declaration of Independence of Ukraine and 4 months before the December independence referendum in which 92.26% Ukrainians voted to withdraw from the Soviet Union, in which Bush cautioned against "suicidal nationalism". 145 days after the speech, the Soviet Union collapsed, partially pushed by Ukraine. The speech was written by Condoleezza Rice—later Secretary of State under President George W. Bush—when she was in charge of Soviet and Eastern European affairs for the first President Bush. It outraged Ukrainian nationalists and American conservatives, with the conservative New York Times columnist William Safire calling it the "Chicken Kiev speech" in protest at what he saw as its "colossal misjudgment" for the very weak tone and miscalculation. The Mikhail Gorbachev presidential campaign, 1996 was an electoral campaign effort by former President of the Soviet Union and General Secretary of the Communist Party of the Soviet Union Mikhail Gorbachev in the 1996 Russian presidential election. Gorbachev's candidacy was beset by the obstacles of both minimal media coverage and a high level of distain towards him amongst the Russian populace. Gorbachev's candidacy ended in defeat during the first round of the election. The effort was the first, and only, electoral campaign of Gorbachev's post-Soviet political career. The 19th All-Union Conference of the Communist Party of the Soviet Union was a party conference held by the Communist Party of the Soviet Union from 28 June to 1 July 1988. There were 4,991 delegates at the conference.